The 99100A Capacitor Reference System comprises a number of highly stable hermetically sealed capacitors with a switch array and a variable high voltage supply. The unique design allows the instrument to be used as a reference for ratio calibration of capacitance measurement instruments. 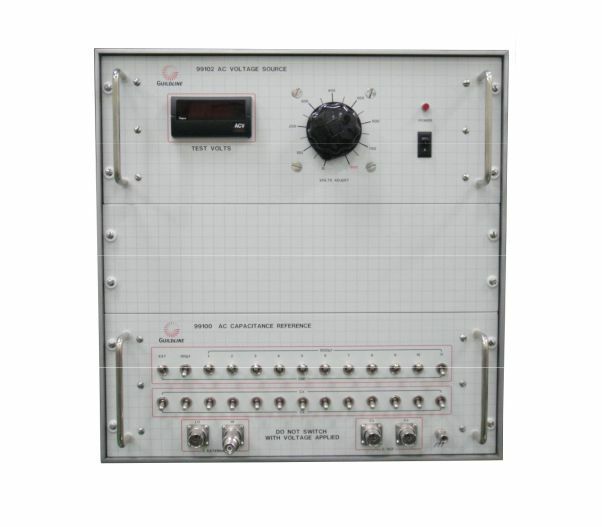 Guildline Instruments model 99100A, Capacitance reference system provides for ratio calibration of Capacitance Measurement Systems. The model 99100A Capacitor Reference System comprises a number of highly stable hermetically sealed capacitors with a switch array and a variable high voltage supply. 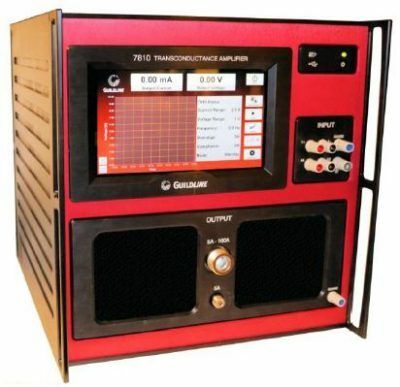 The unique design allows the instrument to be used as a reference for ratio calibration of capacitance measurement instruments. Provision is made for an additional external reference capacitor and also for additional extension of the switched array range with another bank of reference capacitors. The switched array and power supply are housed in a bench top rack cabinet assembly with room for expansion. The switch array allows various combinations of capacitance to be connected in parallel to one of two output connectors. It is only the low side of the capacitors that are switched.